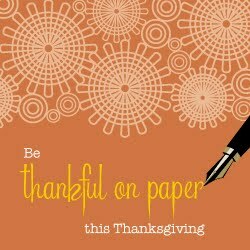 Week Three of Thankful on Paper. As I'm looking forward to flying to California to spend Thanksgiving with Matt's family I realize how thankful I am for the Palmers. I felt like I was family even before Matt and I were married. They've always been so warm, so welcoming and so loving to me. I think sometimes I take for granted how much that means. Quick example, I met Matt's Grandma Sue (Beth's mom) just once while he and I were dating. At that point she was in a nursing home and suffering from dementia, and I'm not sure if she got who I was. When she passed away Matt and I had only been married a short time, but upon reading her obituary in the local paper I was listed as one of her grandchildren. Beth, my mother-in-law (or mom-in-love which is such a nicer term), is one of the most compassionate, gracious and life loving people I know. Dave has this deep content that is contagious. Going to their house is always like a vacation. Pop open a Sierra Nevada ale, put your feet up and just be. From them I have learned what a gift it is to just sit back and enjoy life without rushing through it. When they would come to visit I used to always ask Matt what we should do...go see a movie? Take them downtown? I think I've finally realized they don't need entertaining, they just enjoy being with us, and I'm thankful that I enjoy just being with them. They are both givers, through and through. Matt's family tradition for Christmas was to open presents on Christmas Eve just because Beth couldn't wait any longer. I think Matt's inherited that, seeing as I got my last birthday present three weeks early! My sister-in-law, Katie, is full of love and passion. She is unafraid to jump wholeheartedly into something she believes. She loves selflessly, and searches valiantly for what's important in life. Shortly after my first date with Matt, he graduated college and asked if he and his sister could stay with my family on their drive back to northern California. We weren't even "official" but I remember having so much fun with both of them that I thought, "Sheesh, if this doesn't work out with Matt I still want to be friends with his sister!" Besides Matt's immediate family, I'm grateful to be a part of ALL of them. Matt's Uncle Chris officiated our wedding. When I first met his cousin Rachel it was like seeing a younger version of myself with all her likes and interests (minus the sports)! I first met Aunt June on the Thanksgiving before our wedding (we were married two days after Thanksgiving in 2007) and knew she was definitely family! Last January we went down for Matt's cousin Andrew's wedding to Amber and it was so much fun being able to help out with the rehearsal dinner and help with Teresa's hair and just to be there with everyone. I love that I keep in close contact with my husband's cousin's wife and we just cut all that out and call each other cousin. All that to say I can't wait to get to that little town outside of Yosemite and be with my Mama and Papa Palmer, my sister-in-law and my cousins. I can't wait to sing and play games and laugh with them. Thank You Jesus for this wonderful family I married into! love, love, LOVE this!! it's so great hearing about special in-laws. what a lucky gal you are... i'm sure they are equally lucky to have you. It's so wonderful to have in-laws that you adore. I am also blessed in that department, and I refer to my MIL as "mother-in-lauve" as well. :) You all sound very lucky to have each other. it's so special when you love you in laws so much that your relationships is practically "stand alone" - lucky girl! !